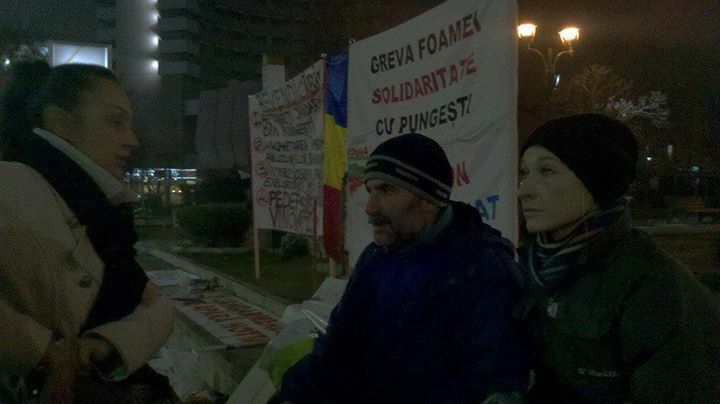 10th DAY OF HUNGER STRIKE IN BUCHAREST – SANDU, OUR HERO. Sandu, the man on hunger strike since 21st of December (today, the 10th day) against the abuses in Pungesti and against fracking, is joined daily by lots of protesters who bring him a hot tea and all their solidarity and love. He is feeling fine (an ambulance visited , motivated by the amazing energy the people bring to him. Every day, there are plenty of people who drop by for a chat or for hours. 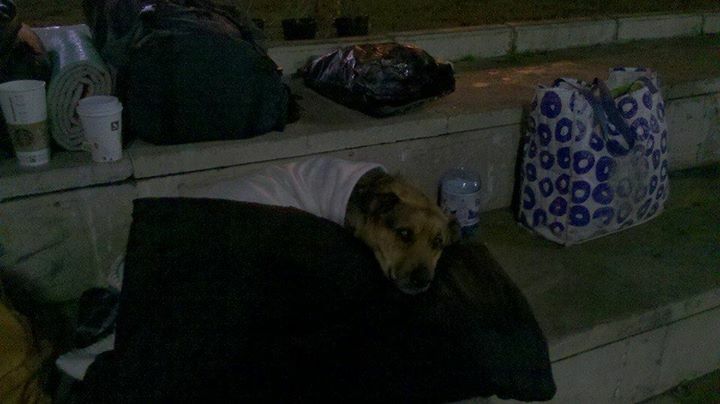 The people make shifts in staying with Sandu, he also has company during the night. The atmosphere is just great, as people get together and discover “old” facebook friends. Riot police stormed into people’s houses, beating them, threatening them, and kidnapping them from their beds to take them to the police station. Pungesti is one of the poorest villages in romania but its people have been standing up against the US giant corporation Chevron for almost four months now. They are facing the Romanian State, extreme brutality from riot police, and behind it all the US army general Wesley Clark. The madness started on 2nd December – one day after romania celebrated its National Day – when the Government imposed a military-style blockade agains the village. The riot police started to abuse people, even children. People from all over the country decided to go to Pungesti on Saturday to support the locals. We arrived there very late on Friday and we managed to reach our hostess – a lady in the village where our friends stayed when they went to Pungesti before – in safety. Old people were pushed and abused because they were shouting at the riot police “Shame on you, you should protect us, this is our land and our lives!. An ambulance was called because an old man from the village was beaten and a 25 years old boy had his ribs broken. The police hit him with their sticks and when he was on the ground they hit him with their boots. In a very short time the riot police started to arrest people without telling why and according to what law. In an attempt to prevent fracking and to maintain access to their own land, villagers and activists broke the fences surrounding 22,000 acres of land, where Chevron was already starting to explore for shale gas. Some of the riot police actually helped to break the fence! After this, most of the activist leaders were arrested, again without any reason or explanation. It was unbelievable for us to see them being arrested for nothing or some of them just for trying to protect the old people from being pushed or beaten. Later, anger, some people threw stones at the Chevron equipment and the security guards were throwing stones back. Then the riot police started to search people saying that we had weapons and also searched the tents in the camp. Media were not allowed there at all but a reporter from Russia Today managed to film and show the abuse on TV. While the conflict was still going on, Chevron issued a press release announcing they would again suspend their activities. Then they filed a complaint against the local villagers for damaging their fences. And the next day, they issued another press release announcing they resumed their operations. Three local teenagers who were taking their cattle to graze on the village’s common land were abducted by the riot police on Sunday morning and taken to the police station in Vaslui. All are underage. Lots of activists were also illegally arrested and taken to the Vaslui police station, and kept there for 5 hours with no medical assistance. Seven people were fined, and will be forced to pay 500 lei to 5,000 lei for refusing to obey the riot police’s orders. These fines are huge: 500 lei is, for most of those people, the entire month’s pension. All of us are expecting to receive fines through post but we know we can appeal because the fines were not supported by any Romanian law. In the evening some activists retired to their remaining tents that the riot police had failed to dismantle. The villagers ran to their homes, chased by the police, who blocked the road in and out of the village again. When night fell, the riot police unexpectedly unleashed terror against the village. They destroyed activists’ tents under the pretext that they were filthy. A blockade was imposed again by the State troops, covering the entire Pungesti commune. Riot police stormed into people’s houses, beating them, threatening them, and kidnapping them from their beds to take them to the police station. Some villagers were fined because they let activists sleep in their houses over night, “illegally”. People hid in their houses in complete darkness for fear of being attacked. In the near-by village of Armasoaia 20 people were caught by the state thugs in the local store. They went there to keep warm, but were still brutally arrested by the riot police. Around 7:30 pm, our friends went to the local store for some groceries. Suddenly, a police van appeared down the road and 10 masked riot police descended. They ran towards them and started to hit them. They beat women and men, locals and visitors. They captured some people and threw them in their van. Someone threw a stone at their van. A boy took out his phone to record what was happening. They attacked him and then they yelled at them that, if they dare film them, they will confiscate the phones. The riot police came to the village at night fall to arrest the protesters they could not capture at the Chevron site during the day. Nobody was safe, not even the journalists – they even arrested a famous Romanian journalist, Oreste Teodorescu. Some people called 112, the emergency police number, to ask for help. But the local police said they were unable to help. The next day most of us decided to go to Bucharest to protest there and it was the same story of abuse from the riot police. Every single day they broke the law of Constitution and forgot about our right to freedom in a democratic country. The villagers continue to fight to save their land and water resources. They are very poor people who lived there all their lives and so did their parents and grandparents. They have to work on the fields in order to survive so that land and the water is very important for them. Nobody asked them if they want Chevron to abuse and poison them and their children. The government ignores their fears that fracking would ruin water and everything around. There is huge profit and military power against people’s lives. On one side there is aggression, on the other, self-defence. The Romanian State, who like to appear nationalistic and full of religious and patriotic values, are actually supporting the giant corporation Chevron. The Romanian government has (illegally) given Chevron 22,000 acres of land in Pungesti to start explorations for shale gas by hydraulic fracturing. The government granted Chevron rights to explore for shale gas in three other places, in South-East Romania, in Constanta county: Vama Veche, Adamclisi and Costinesti. Before the 2012 parliamentary elections the current prime minister, Victor Ponta opposed these deals. He accused the previous prime minister, Mihai Razvan Ungureanu – the former chief of a secret Romanian service – of cutting a shady, secret deal, and promised to fight against it. But once he became Prime Minister, Ponta suddenly expressed support for Chevron and gave them the green light to start exploring. We believe the man behind this is former US Army General Wesley Clark, presented as “an excellent economist” who is now Ponta’s new adviser on issues of economic strategy. After the riot police imposed a military-style blockade against the people of Pungesti, following their relentless resistance, the Romanian Prime Minister saluted the brutality of the police beating people: “I praise the riot police for their actions at Pungesti”. Locals are determined to resist Chevron, the government and their riot police, as the tensions grow day by day. In another development the local mayor of Oradea in north-west romania refused a request by a Hungarian company, a subcontractor of Russian Gazprom, to start exploring for shale gas. Local media saluted the mayor’s refusal for saving their water resources. Villagers from the central Romania county of Sibiu – my own birth-town – blocked similar explorations by a Romanian company. Resistors took the company’s equipment and banned them from their land, despite being attacked and threatened by the police. We all know the environmental disaster Chevron caused in the Ecuadorian Amazon and we Romanians have to fight against such damage happening in our own country. In places like Pungesti we depend our land, forests, pastures, fields, streams, springs, wells and animals – they are all that we have. We have no salaries or financial investments. This is why we have to fight Chevron, because we know that if we do not defeat them they will leave behind a poisoned landscape where we and our animals can no longer survive. We also know we can win, if only we fight hard enough. Our Senate voted down the Rosia Montana mine in Transylvania on 2 December, after a 14-year battle, and just two days ago this was confirmed by the lower house. This is where Gabriel Resources wanted to dig out the largest open pit gold mine in Europe, and use cyanide to extract the gold. If we can win at Rosia Montana, so too can we win at Pungesti. Despite the news that spread on the 27th of December that the hunger strike was interrupted until the beginning of the new year, the hunger strike still goes on. 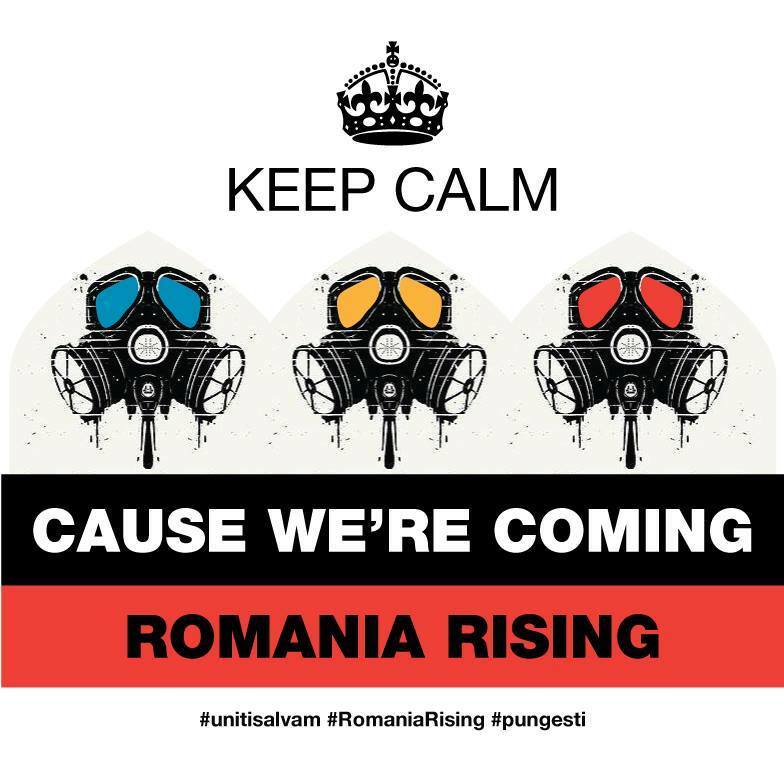 Some of the activists have given up on it, since they had to go and organise things, as new rigs are erected in new parts of Romania, without any notice (such as Botorca, Sibiu country and Comandau, Covasna county), 13 locals from Pungesti and 2 activists from outside, aged 30 to 59, still continue this form of extreme protesting against fracking. 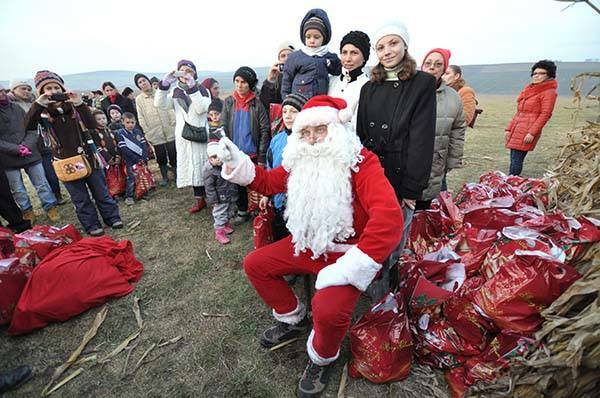 The activists from Bucharest and Romania organised a surprise for the brave tortured kids of Pungesti, who were prevented from singing carols and having a Christmas party at school. Armed with hundreds of tones of donations (clothes, toys, books etc), plus 450 bags of sweets for all the kids aged 1 to 14, we organised Santa’s Caravan, who left Bucharest on 27th of December. We had arranged a private hall (something like a ballroom) for the event and everything seemed ok, until we got there and found out that, due to the huge pressures (from the mayor who has beaten up a 12 years old kid on the Cristmas night), the owner of the ballroom decided to drop the reservation he made for our event. We were therefore forced to deliver all the presents in the camp where people were on hunger strike, in the cold and the mud. Yet the joy of the beautiful, brave and intelligent kids of Pungesti brought tears to our eyes and we forgot everything when seeing the joy of the kids who have seen Santa for the first times, in many of the cases. We thank everyone who has contributed to making this happen! We have showed that solidarity is the way to overcome fear and major obstacles! Meanwhile, some brave Pungesti locals are still on hunger strike, who has begun on the 23rd of December. Some of the activists have dropped it, since they need to stay mobile, ready for the emergencies that surface every moment, every hour. The Association for the Defense of Human Rights in Romania – Helsinki Committee (Asociaţia pentru Apărarea Drepturilor Omului în România – Comitetul Helsinki – APADOR – CH) published on its site a report concerning serious abuses perpetrated by state authorities in Pungeşti, a village that has been occupied by the riot police, and whose inhabitants have been beaten, fined, and terrorized because they stood upagainstaChevronshalegasextractionproject. In the wake of the investigations carried out by the APADOR-CH team in Pungeşti, the organization concluded that the law enforcement units intervened in force, making use of violence repeatedly against the protesters from Pungeşti. APADOR-CH showed in its report that the villagers from Vaslui County are too scared to file complaints, and request that the Prosecutor’s Office attached to the Vaslui Court of Justice open an investigation into the abuses carried out by law enforcement units against the villagers. It is of public knowledge that tens of criminal files have been opened against the protestors – files that are currently being processed by the Prosecutor’s Office; several complaints have been filed against the riot police by ecological activists and protesters. The conclusions contained in the APADOR-CH report were reached after APADOR-CH representatives arrived in Pungeşti, on the 17th of December, and carried out discussions with approximately 30 villagers and two ecological activists, but also with representatives of the relevant state authorities; the conclusions were further reinforced by live observations. The organization informs that the local inhabitants were hesitant about having their names appear in the report. Once arrived in Pungeşti, the APADOR-CH representatives found the village under the control of police units: auto control filters were strewn on the departmental road linking it to the neighboring villages; Ministry of Internal Affairs vehicles followed any car entering the departmental road and until it got beyond the area occupied by Chevron. Roadside stops were and are forbidden, and the villagers live in a constant state of terror. The inhabitants of Pungeşti complained about being under constant pressure; they are asked for ID papers even when taking their cows to the pasture or while fetching water from the well; they are fined for preposterous reasons: not wearing reflective vests, or lacking license plates on their bullock carts. Some villagers complained about having been aggressed; they affirmed they had seen people of all sorts – men and women, young and old – covered in blood after the intervention of the riot police. The villagers from Siliştea complained about not being allowed to exit their houses and their courtyards after 6:00 p.m.; some of them affirmed they had been beaten by the riot police, just for breaching the order, that was given verbally. They also stated they are not allowed to walk through the village in groups of more than three persons. The villagers that have fallen victim to the violence carried out by the law enforcement units are afraid to file formal complaints; those that have not been directly aggressed are afraid they may be the next in line. Pungesti has the feel of a place under siege. ￼security area, held under the control of the police and of the riot police, APADOR-CH concludes that the law enforcement units repeatedly made use of violence against the protesters from Pungeşti; fundamental rights of the inhabitants of Pungesti are being violated under the pretext of the upholding of public order. Fundamental rights granted by the Constitution to the people of the municipality of Pungeşti (be they protesters or not) are violated. The local inhabitants have seen restrictions imposed on their right to free circulation (art. 25),on their right to free expression (art. 30),on their right to information (art. 31) and free assembly (art. 39). Under the pretext of the maintenance of public order, and without receiving any official notification, the villagers are confronted, daily, with hardships specific to a place under siege. APADOR-CH considers that the decision taken by the authorities, to institute a special public safety area, is excessive. It requests that the restrictions be removed. We remind that the restriction of fundamental rights and freedoms is acceptable, according to the European Court of Human Rights (ECHR), only if three conditions are simultaneously fulfilled: that it be within the frame of the law; that it serve a legitimate purpose and that it be necessary, in a democratic society. The last of the three conditions supposes, amongst other things, a proportionate adequation of the restrictions to the aim that is pursued. APADOR-CH also shows, in its report, that the riot police forces present within the limits of the municipality of Pungeşti refused any communication with APADOR-CH representatives; it was also impossible to contact the spokesman of the riot police force using the telephone number featured on the Internet page of the Police Department of Vaslui County. The deputy mayor declared that the office of the mayor has not been notified through an official act about the institution of special measures in the area; the local police force refused to answer the questionsofAPADOR-CH,invokingthesecrecystatusofthesolicitedinformation. Chief commissioner Cătălin Popa merely declared that a decision exists, concerning the establishment of a special public safety area for an unlimited period of time; that decision has been taken at the level of the leadership of the Police Department of Vaslui County. We remind the reader that the inhabitants of Siliştea-Pungeşti, the locality for which the Chevron has received a license for the exploration of shale gas, are under 24 hour supervision by the law enforcement units; they are intimidated, fined, terrorized – all the above in order to ensure that the workings of the giant gas company Chevron are carried on “without disturbances”. 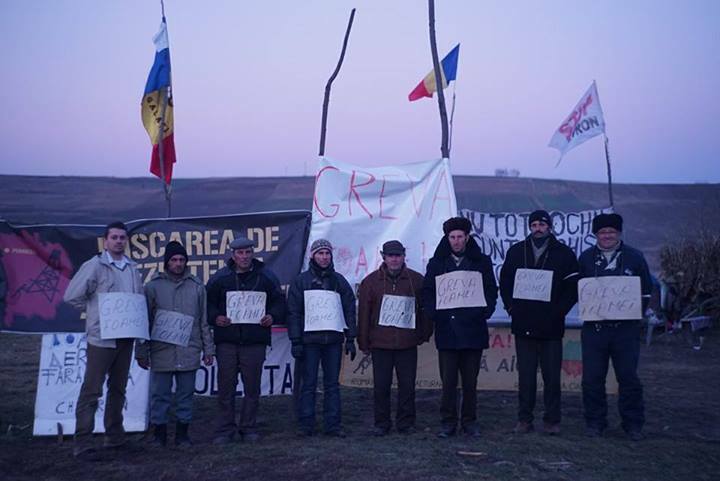 In mid-October, the inhabitants of Siliştea formed a human chain in order to prevent the installation of Chevron extraction equipment – as the company was about to install the first shale gas extraction rig that would function on the territory of Romania. The riot police acted in force, dispersing the human chain. The action was condemned by Romanians, who declared their solidaritywiththeprotestersfromVasluiCounty.Theechoesfound,bothnationallyand internationally, by the protest of the citizens of Pungeşti, led Chevron to decide a postponing of the operation. One day after the protests took place in Siliştea, the local council decided to forbid shale gas extraction on the territory of the village; the local council members decided the same day that a referendum should be held on this topic. The decision of the local council has been forwarded, for validation, to Vaslui-city, the county seat; however, it was sent back from there to the local village council, with a demand that the decision be revoked. The council members refused to comply. It was then decided by the Administrative Office of Vaslui County to take legal action against the decision that forbids the exploration and exploitation of shale gas on the territory of the village. On the 2nd of December, the drilling equipment was once again sent over by Chevron – escorted, this time around, by the riot police. The local villagers were struck down, beaten, fined and assaulted; the villagewasoverrunbypoliceforces,andpatrolsroamed incessantlyitsstreets,bynightandbyday. When they arrived in Pungeşti, our reporters found a village under siege, terrorized by the riot police. Women in their old age told our reporters about having been hit in the chest with riot shields and trampled on over their hands with the boots by the riot police. People were beaten while fetching water from the well, or simply because they happened to be on the street. One villager was beaten because he was carrying a cross needed for a tomb. On the 7th of December, there was a gathering of protesters from the whole country. Given the background of general discontentment, the protesters – possibly goaded on by provokers – entered the Chevron precinct. According to the riot police, they tore down the surrounding fence and threw stones towards the trucks and the equipment placed there. Arrests, criminal files and fines followed in tow. The intervention of the riot police found a strong echo in the media; as a consequence, Chevron issued a communiqué through which it stated that work on the site was suspended. It was, however, resumed one day later, and the police from Vaslui came over to lend a helping hand to the gas company: the riot police forces dispatched there were supplemented considerably – a state of things that was also noticed, on the 17th of December, by the APADOR-CH representatives.